(I) Discount nominal cash flows by nominal discount rates. (II) Discount nominal cash flows by real discount rates. (III) Discount real cash flows by nominal discount rates. (IV) Discount real cash flows by real discount rates. Which of the above statements is or are correct? (d) I and IV only. (e) II and III only. Which business structure or structures have the advantage of limited liability for equity investors? A company conducts a 4 for 3 stock split. What is the percentage change in the stock price and the number of shares outstanding? The answers are given in the same order. Over the last year, bad economic news was released showing a higher chance of recession. Over this time the share market fell by 1%. The risk free rate was unchanged. What do you think was the stock's historical return over the last year, given as an effective annual rate? (a) Obligation to buy the underlying oil at $44 per barrel. (d) Obligation to buy the underlying oil at $44 per barrel if the counterparty chooses to sell it. 20% invested in stock B. No change in stock B's price. No dividends were paid on either stock. What was the total historical portfolio return on this day? All returns above and answer options below are given as effective daily rates. An Apple (NASDAQ:AAPL) stock was purchased by an investor for $120 and one year later was sold for $150. A dividend of $4 was also collected at the end of the year just before the stock was sold. Which of the following statements about the stock investment is NOT correct? Ignore taxes. (b) Dividend income of $4. (c) Capital return of 25%. (d) Dividend yield of 2.6667%. (e) Total return of 28.3333%. Adam and Bella are the only people on a remote island. Luckily there are Coconut and Date palm trees on the island that grow delicious fruit. The problem is that harvesting the fruit takes a lot of work. Adam can pick 7 coconuts per hour, 6 dates per hour or any linear combination of coconuts and dates. For example, he could pick 3.5 coconuts and 3 dates per hour. Bella can pick 3 coconuts per hour, 5 dates per hour or any linear combination. For example, she could pick 1.5 coconuts and 2.5 dates per hour. (a) Adam’s opportunity cost of picking one date per hour is 7/6 coconuts, so he picks around 1.1667 coconuts per one date per one hour. 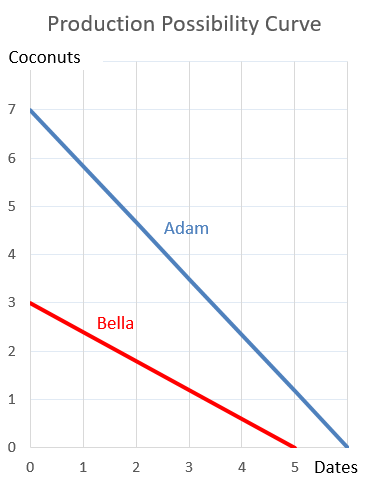 (b) Bella’s opportunity cost of picking one date per hour is 3/5 coconuts, so she picks around 0.6 coconuts per one date per one hour. (c) Adam’s opportunity cost of picking one coconut per hour is 6/7 dates, so he picks around 0.8571 dates per one coconut per one hour. (d) Bella’s opportunity cost of picking one coconut per hour is 5/3 dates, so she picks around 1.6667 dates per one coconut per one hour. (e) The gradients (rise over run) of the lines in the graph are measured in dates per one coconut per hour.